Where did I get it? It was on Kindle for 99p a few weeks ago, and since many of my fellow YA loving friends have read it and recommended it to me, I thought I'd buy it. I wasn't planning to read it on holiday, so gave myself permission to read just a few pages to see what I thought. I was immediately hooked! What's it about? 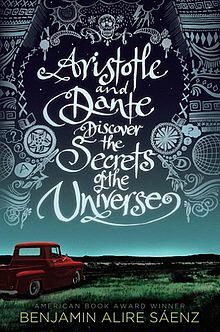 Set in 1987, it's a coming of age story featuring Mexican-American teenagers Aristotle and Dante and set in El Paso, Texas. It's all from Ari's point of view. His family is a bit complicated; his sisters are much older than him and his older brother Bernardo is in prison and no one will talk about him. Ari's mum worries about his constantly, and his dad, a Vietnam veteran, has secrets he won't tell. At the pool one day Ari meets Dante. Dante's an only child and gets on well with his parents, but isn't sure where he fits into life as a Mexican-American. The two become inseperable even though Aristotle is practically impenetrable in terms of showing his feelings. Over the next year and a bit we follow the two boys as they do indeed discover many secrets about each other, their families, and themselves. I loved both boys and their families, but especially Aristotle. Reading the novel from his point of view was just perfect for me. Are any main characters LGBTQ+? Yes, and it's explored in such a beautiful way. Are any main characters people of colour? Yes and again, it's explored so beautifully. Are any main characters disabled either mentally or physically? For a time, yes. No spoilers! What criticisms do I have? Barely any at all. I thought it was just so pretty and nice to read. I would have liked Aristotle to communicate more, but I understand that it was very much part of his character. Would I recommend the book? Yes, one hundred percent. If you like YA or LGBTQ literature, definitely read this if you haven't. It's a stand out example of YA as a genre I think. Why did I choose to read it at this point in life? Like I said, I was just browsing through my Kindle books. What other books is it like? Something like The Perks of Being a Wallflower only better. How many stars? Nine out of ten, I'm so glad I read it. I immediately went on Archive of Our Own to read some fic, which is very unlike me but goes to show how much I didn't want it to end!